We're excited to announce the ORC is undergoing a complete renovation. Look for the new tool to be available in 2019! In the meantime, the following information will give you an overview and may generate ideas on how you can use the ORC in your own district. Contact us with any questions, requests, or suggestions you may have. We welcome your input! And if you want to get involved in our ORC Advisory Board or become a pilot school for the new tool, let us know that too! What areas of school operation are impacting your ability to provide a cost-effective, healthy learning environment? Do you know what part of your campus you should invest in when you develop your next bond? Can you tell if recent capital investments have resulted in a quantifiable improvement in building performance? The Operations Report Card™ (ORC) helps you answer these questions with confidence. With the ORC, you can benchmark the performance of your existing schools and develop data-driven improvement plans that save precious school operating dollars. 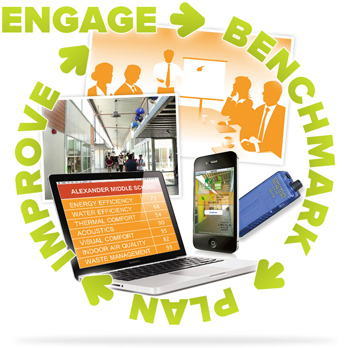 The web-based ORC guides users through several benchmarking steps, including gathering school-wide building/systems data, conducting an occupant survey, collecting classroom measurements, completing ENERGY STAR Portfolio Manager and performing water fixture and waste audits. After entering all of the required information, the school is provided with a Report Card and a customized list of suggested improvements based on their site information. Use this list to create an action plan of improvements to get on the road to higher performance.